The literary and artistic talents of this versatile signer brought him more acclaim than his political and legal activities. Although a lawyer and judge by profession, he achieved more eminence as an essayist, poet, artist, and musician. His verse and satirical essays rank among the better literary efforts of the Revolutionary and early Federal periods, and he was one of America's first native composers. 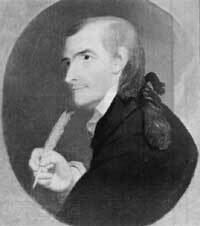 His eldest son, Joseph (1770-1842), wrote "Hail Columbia" and won distinction as a lawyer, jurist, U.S. Congressman, and patron of the arts. Hopkinson was born at Philadelphia in 1737, the eldest of eight children. His father, who died when he was 14, was a prominent lawyer-jurist, politician, and civic leader. Upon graduation from the College of Philadelphia (later part of the University of Pennsylvania) in 1757, young Hopkinson studied law under Benjamin Chew, attorney general of the province, and 4 years later joined the bar. In 1763 he obtained the position of customs collector at Salem, N.J. Three years hence, after failing in business, he sailed to England to seek an appointment as colonial customs collector through the influence of friends and relatives. During his yearlong stay, though unsuccessful in his vocational quest, he visited Benjamin Franklin, Lord North, and other prominent people, and may have studied under artist Benjamin West. Back in Philadelphia, Hopkinson operated a store and married in 1768. Four years later he became the customs collector at New Castle, Del. About 1774 he took up residence at the home of his father-in-law in Bordentown, N.J., practiced law, and began a 2-year tour in the legislature. As a Member of the Continental Congress for only a few months in 1776, he relieved his ennui by drawing caricatures of his colleagues. His later offices included: chairman (1777-78) of Philadelphia's Continental Navy Board, treasurer of loans (1778-81), judge of the admiralty court of Pennsylvania (1779), and Federal circuit judge for the eastern district of the State (1789-91). During his busy public career, the ambitious Hopkinson managed to leave his stamp on the fields of music, art, and literature. His "My Days Have Been So Wondrous Free" (1759) probably represents the first American composition of secular music; his "Temple of Minerva" (1781), the first American attempt at opera. In art, he was noted particularly for his crayon portraits and his work on heraldic emblems. But his literary attainments surpassed all his others. Between 1757 and 1773, Hopkinson contributed numerous poems and essays, many of them in a humorous and satirical vein, to various periodicals. The following year, he began advancing the patriot cause. A profusion of widely read and influential pamphlets, essays, and letters, often presented in an allegorical style, derided and ridiculed the British and the Loyalists, outlined colonial grievances, and encouraged the colonists. The Prophecy, written in 1776 before the adoption of the Declaration of Independence, predicted that event. After the war, Hopkinson continued to treat political and social themes, and became one of the best known writers in the United States. While a Federal circuit judge, Hopkinson died in Philadelphia at the age of 53. He was laid to rest in Christ Church Burial Ground. Surviving him were his widow and five children. Drawing: Oil, before 1854, by Dubois (probably Samuel T.), after Robert E. Pine, Historical Society of Pennsylvania and Indpendence National Historical Park.